After cosmetic surgery clients often have big bruises. These bruises and swellings, particularly in the facial area can be unpleasant. We asked one of our qualified Prague plastic surgeons, Dr Hubert Topinka MD, for his opinion on how to cover problems area until they disappear. „I have experience of clients who try to cover these unpleasant marks after cosmetic surgery, especially eyelids surgery and face lift. After the surgery it is preferable to use make-up for sensitive skin, which is not perfumed so the skin is not irritated. Every plastic surgeon will recommend that the client postpones using make-up, whether to cover up fresh scars or haematomas, until they are fully healed. However, all stitches have to be removed until anything can be applied to the skin.“, Dr Topinka. 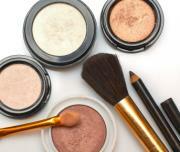 „In some cases it can happen that the client is not able to use make-up at all. If, the application of make-up leads to irritation erythema of the skin, it is important to cease using it immediately. It could complicate healing. It is also the case that patients do not listen to the recommendations of the plastic surgeon and start make-up application just a few days after the surgery – this can result in infection and other complications, which will extend the healing process for much longer.“, Dr Topinka declares.